Word sense disambiguation (WSD), the task of identifying a word's meaning in context, has long been recognized as an important task in computational linguistics. Traditional approaches to WSD rest on the assumption that there is a single, unambiguous communicative intention underlying each word in the document. However, there exists a class of language constructs known as puns, in which lexical-semantic ambiguity is a deliberate effect of the communication act. That is, the speaker or writer intends for a certain word or other lexical item to be interpreted as simultaneously carrying two or more separate meanings. Though puns are a recurrent and expected feature in many discourse types, they have attracted relatively little attention in the fields of computational linguistics and natural language processing in general, or WSD in particular. When the church bought gas for their annual barbecue, proceeds went from the sacred to the propane. Puns where the two meanings share the same pronunciation are known as homophonic or perfect, while those relying on similar- but not identical-sounding signs are known as heterophonic or imperfect. Where the signs are considered as written rather than spoken sequences, a similar distinction can be made between homographic and heterographic puns. Conscious or tacit linguistic knowledge – particularly of lexical semantics and phonology – is an essential prerequisite for the production and interpretation of puns. 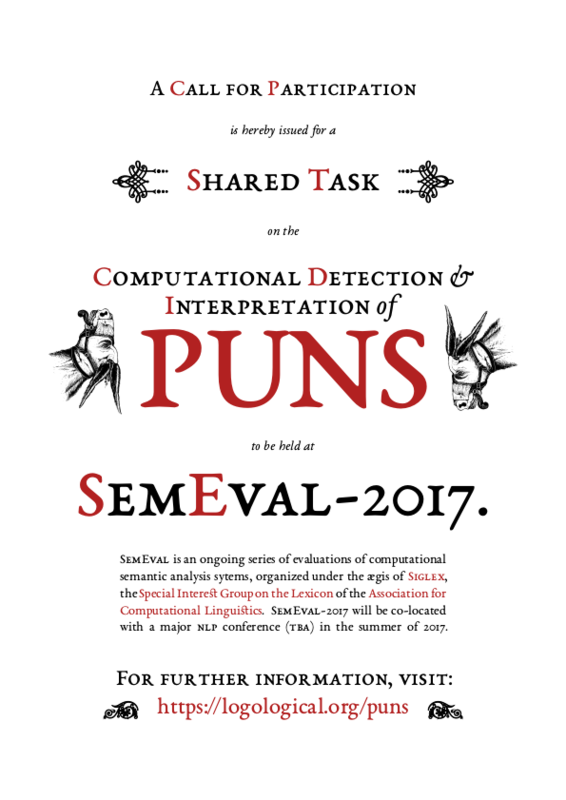 This has long made them an attractive subject of study in theoretical linguistics, and has led to a small but growing body of research into puns in computational linguistics. Most computational treatments of puns to date, however, have focused on generational algorithms or modelling their phonological properties. Data set 1: Homographic puns. The first data set will contain several hundred short contexts (jokes, slogans, aphorisms, etc.). In some of these contexts, a single word will be used as a homographic pun; in the rest, there will be no pun. Data set 2: Heterographic puns. The second data set will be similar to the first, except that the puns will be heterographic rather than homographic. For this subtask, participants are given an entire raw data set. For each context, the system must decide whether or not it contains a pun. For this subtask, the contexts not containing puns are removed from the data set. For each context, the system must identify which word is the pun. For this subtask, the pun word in each context is marked, and contexts where the pun's two meanings are not found in WordNet are removed from the data set. For each context, the system must annotate the two meanings of the given pun by reference to WordNet sense keys. The evaluation for this task, which used the CodaLab Competitions platform, is now over. The Codalab Competitions pages for Subtask 1, Subtask 2, and Subtask 3 will be maintained for archival purposes.